August 6, 1986: After months of hearing boos at Shea Stadium, George Foster was finally released by the Mets on August 6th 1986. The Mets were already the best team in baseball at that point and Foster had become expendable. After 87 games he was batting .227 with 13 HRs 6 doubles & 38 RBIs. He was picked up by the Chicago White Sox a week later where he would hit .216 in 15 games with a HR, then retire at the end of the season. 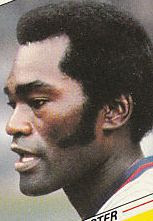 Foster had arrived in New York in 1982. He had no protection in that line up and his numbers from his Big Red Machine Days were never to be matched again. Looking back, his numbers weren't all that bad. In 1983 he hit 28 HRs with 90 RBIs but only batted .241. 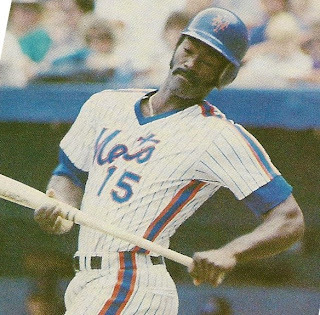 In 1984 he hit 24 HRs with 86 RBIs and improved to a .269 average as the Mets finished second. In 1985 he hit 21 HRs with 77 RBIs batting .263 as the Mets finished in second place again. Expectations were always high for Mr. Foster, and tough to live up to. By 1986 he didn't fit in anymore, his team mates gave up on him too. During a bench clearing brawl with the Los Angeles Dodgers in late May, Foster was the last guy out of the dugout. He accused the Mets team & organization of being racist, but as Dwight Gooden & Daryl Strawberry were two of the main faces of the franchise it was hard to believe. Then a young Kevin Mitchell, took over Fosters position & it was even more clear who the problem was. Foster was a forgotten Mets player although he had some good years & did help give the club some credibility during some down years. Foster was finally forgiven for his Mets sins, at the closing ceremonies of Shea Stadium in 2008.